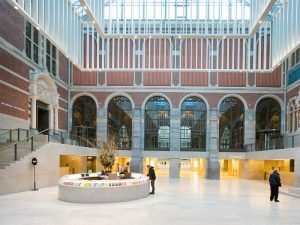 Rijksmuseum in Amsterdam is one of 16 state museums in The Netherlands. The collection provides an overview of Dutch art and history with work from Dutch masters such as Rembrandt van Rijn, Johannes Vermeer and Frans Hals. Cuypers. The collection of paintings from the Rijksmuseum provides an overview of Dutch painting from the 15th century to around 1900. The emphasis here is mainly on the 17th-century Dutch Masters. The museum also has a small collection of South-Dutch and Italian masters. At the end of the room is the most famous work of the museum, the Night Watch of Rembrandt. In the years 1950 to 1990 the book “120 Paintings” from the museum was published, containing black and white photographs of a selection of 120 paintings from the museum. Museum Square (Museumplein) is a public space in Amsterdam. Three major museums are located here, the Rijksmuseum, the Van Gogh Museum and the Stedelijk museum. The square is also used for big events such as festivals, celebrations or for watching important football matches on big screens. For visiting the center of Amsterdam and the larger Region of Amsterdam you may buy the Amsterdam & Region Travel Ticket for 1-2-3 days. A very handy ticket for visting place like the Zaanse Schans.